“ … I didn’t realize it at the time, but his head nodding really affected me during the negotiation. I almost felt like I was hypnotized.” That’s the power of head nodding in a #negotiation. If used right, head nodding can be a really powerful gesture in a negotiation. If used excessively, it can give the appearance of a know-it-all that knows a lot about nothing but thinks he does; that could give the impression that the person doing the nodding is self-centered, egotistical or a BS artist. Continue reading to discover why, if done right, head nodding in a negotiation is such a powerful ploy to employ in a negotiation. When you’re engaged in a negotiation, nodding your head as you make a pronouncement lends credence to what you’re conveying. The subliminal message that’s conveyed is, I really believe what I’m saying is true, and I’m committed to my statements. Your challenge is to dissect when the real truth is reality, versus the other negotiator attempting to convince you that what he’s saying is reality. The best way to promote this gesture is to smile and maintain eye contact with the other negotiator as you’re speaking. To enhance the effect, pause for 1 second as your speaking to denote something important is about to be said. Then, as you make that pronouncement, nod your head to emphasize the point. The combination of the head gesture, smiling and maintaining eye contact as you deliver your statement will have a hypnotic effect on the person with whom you’re speaking. It’s also worth noting that people who are aligned with what you’re saying when you display a head nod will tend to nod back at you. Their gesture not only serves as confirmation that they agree with you, at that moment, they’re also allowing you to lead them. Thus, it behooves you to observe to what degree your negotiation companion nods in return to your head nodding. Nodding excessively will dilute the emphasis that such a gesture has during a negotiation. Therefore, don’t nod too frequently. Doing so could cause the other negotiator to nod off, which means he’ll pay no attention to your nodding gestures. Another thing to consider is what words you choose to emphasize when making this gesture. If the action is synchronized with the wrong word(s), you could end up shifting the perception of what’s important. In that case, you’d have your negotiation counterpart psychologically wondering exactly what you’re attempting to convey and where you’re headed. A lot of information is conveyed through the gesture of head nodding. Be mindful that good negotiators may attempt to use this gesture as a tactic to assess to what degree, and when, you might follow their lead. Thus, you must be alert to the way you respond to such action; your reaction or lack of will emit a signal that can be used as a gauge by the other negotiator. If you want to enhance your believability during a negotiation, nod when making statements that you want others to believe in. That simple gesture, accompanied by strong eye contact and a smile while delivering your message, will enhance your negotiation efforts … and everything will be right with the world. 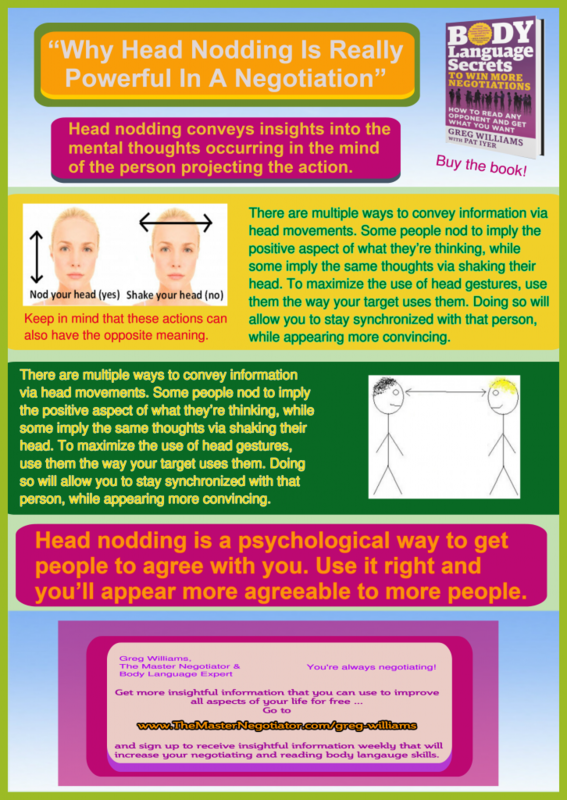 The post “Why Head Nodding Is Really Powerful In A Negotiation” – Negotiation Tip of the Week appeared first on The Master Negotiator & Body Language Expert.